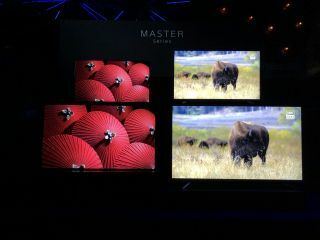 Sony reveals flagship Master Series TV range with AF9 OLED and ZF9 LCD | What Hi-Fi? The AF9 OLED and ZF9 LCD/LED models now share top-billing in Sony's TV range. Move over MasterChef and never mind Mastermind - the Master Series is here. Sony's announced two new flagship models, and they carry a confident name. The two models unveiled today are the AF9 and ZF9 (A9F and Z9F to our American friends). The former is an OLED model that takes the place of the A1 at the top of Sony's OLED offering, while the latter is an LCD with direct LED backlighting that sits above the much-loved but long-in-the-tooth ZD9. Both are powered by Sony's brand-new X1 Ultimate processor, which brings with it advanced picture features such as Object-Based HDR Remaster and Object-Based Super Resolution. The AF9 (pictured above) also features 'Acoustic Surface Audio+'. This is the next generation of the screen-vibrating sound solution first introduced with the A1, but here features an additional centre actuator and another sub, creating a 3.2 speaker array in total. The TV can even be set to act as the centre speaker in a full surround system. Sony describes both of these screens as 'professional grade monitors', designed to represent the full intent of the content creator. To that end both carry something called 'Netflix Calibrated Mode'. "Sony makes some of the best TVs on the market today, and the Master Series is the best of the best," a Sony spokesperson stated. We're happy to agree with the first part of that sentence, but will have to reserve judgement on the second until the Master Series arrives in our testing rooms. The AF9 will be available in 55in (Sony KD-55AF9) and 65in (KD-65AF9) sizes, while the ZF9 is coming in 65in (KD-65ZF9) and 75in (KD-75ZF9) versions. Prices and availability are still to be confirmed - more when we get it.